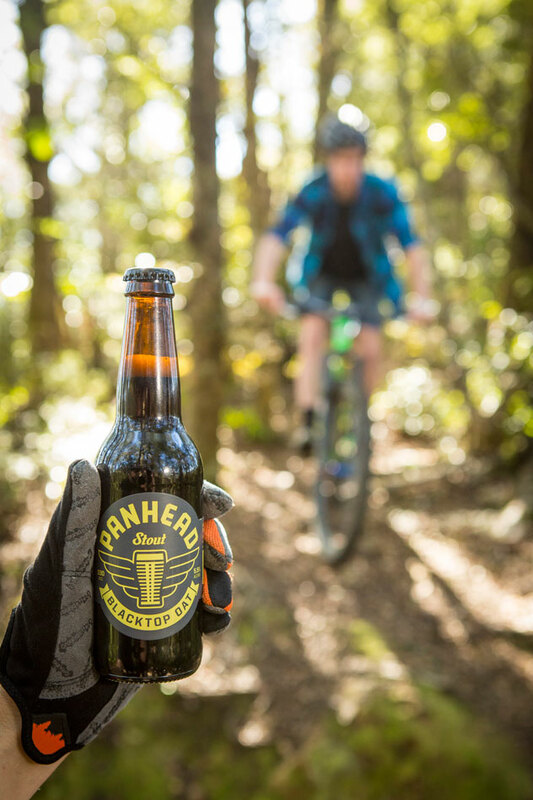 In Issue 59 our resident beer experts took to the trails of Wellington armed only with a chilly bin of local brews, a couple of muesli bars and an insatiable desire to get drunk during the middle of the working week while riding bikes in the name of 'research'. Somehow we managed to survive the day with only minor headaches, no broken bones, and this video evidence that we actually did ride each trail and drink each beer. And then some. Cheers. Boutique beer thrived in the capital because clever innovation met a ripe demographic. That is, bureaucrats and young professionals with disposable income and the desire to distinguish themselves. And what could be a plumper target for cultural renovation than the humble beer? Purists will argue that mountain biking took hold because of the city’s topography: clustered suburbs broken by bushy ridges that offer long and varied city-wide traverses. But it’s also a hobby of opulence. It’s the perfect sport for the cultured connoisseur to demonstrate their adventurous side. It’s a BBQ byword. Water cooler fodder. Plus, being a roadie is far too Auckland, or Christchurch, or whatever. However, it would be ungracious of me not to concede that I enjoy having a broad range of delicious beers and varied trails from which to choose. And it would be very Wellington of me to celebrate it. 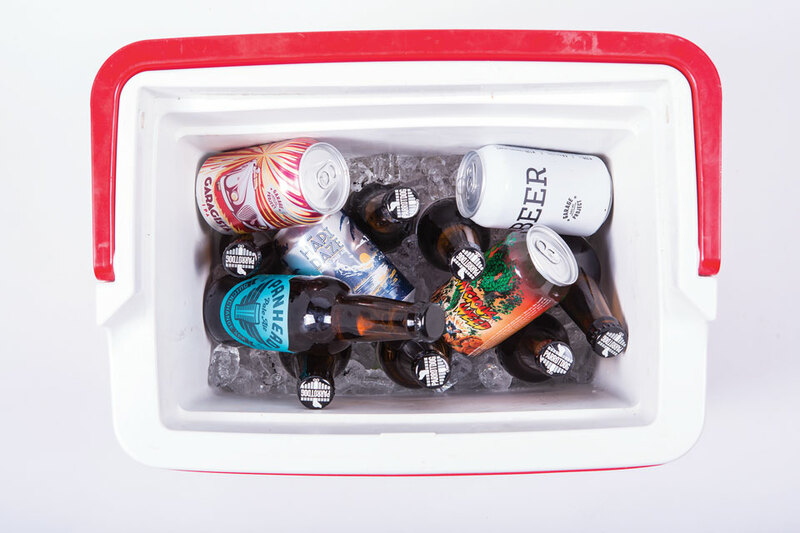 Therefore, I present to you the ultimate in swanky comparison––a pairing of craft brews to local trails. A degustation piece fit for bohemian consumption. Damien’s is a little bit feral. It consists of a rough and ready line, cut through a few high-commitment features, bedded in over the years by the High Roller IIs of a thousand groms. It’s diabolical in the wet. Many a patron over the years has spilled blood into its dirt. Hell, delinquents sometimes even booby-trap it. The beer it ended up with had to have a chunky flavour. It had to be big. At 6.3% ABV, Bloodhound is in the right ring, but the flavour is what really gets it there. It’s a red ale, bigger than an IPA, with dynamic flavours that cut through a malty warmth. The bitterness is refreshing, and its punch comes from a totally different angle to a traditional IPA. The taste captures your attention, and goads you to have a little more. Discovering Damien’s in the middle of the city is a boorish sort of a good time. It feels like you’re cheating the system––like visiting a classy restaurant and finding a sloppy plate of ribs on the menu. And when you’ve grown accustomed to the civilized craft IPA fare, stumbling upon Bloodhound is a similar experience. It delivers that little bit of mongrel you didn’t know you were craving. Hāpi Daze took a little tinkering to perfect. The Garage Project boys found that cultivating a full, hoppy flavour in a low percentage beer was a delicate task. Serendipity feels much the same way, teething issues and all. It feels like a purpose-built flow trail that’s meant to retain a level of accessibility, but at the time of writing it wasn’t quite hitting the mark. The corners were a little awkward, the jumps were questionable and an extended uphill pedalling section sapped any flow you’d gained from the previous sections. But far from being a problem, this simply speaks to the difficulty of the task. The fact that we have Serendipity at all is a boon. That it was built by hand is even more impressive. But carving out a boisterous descent that skilled riders are able to shred on conflicts squarely with the goal that it remain part of a key commuter artery into the city. It may be a hard balance to strike, but it’s surely possible. The eventual form of Hāpi Daze is wonderfully executed. The flavour is assertive and well balanced, yet at 4.6% it’s well within the purview of the everyday beer drinker. With a little adjustment, Serendipity is bound to be just as great. Unless you’re a ruthless beechhound with an insatiable appetite for squirmy tech, Rata Ridge ain’t gonna be your everyday rinse. It’s the escapist’s playground––the essence of backcountry riding, just a stone’s throw from urban comforts. It’s so far removed from conventional Wellington trails that your entire approach to riding requires adjustment. You have to be ready and in the mood for its particular nuances. The same can be said of a big stout––you rarely choose it when you’re feeling indecisive. “Fat and chewy doesn’t always mix with delicate and complex, but it does in Blacktop.” That could equally be the tagline of Rata Ridge, right there. The loose, blackened soil of the ridge is unearthed into Blacktop’s inky body. Intricate root beds sprawl into bitter hops that punctuate the brew. Caramelised golden oats fall as flecks of sunlight through sweeping canopies of beech. You know what you’re in for when you tackle the Ridge, and the same holds true when you open up a Blacktop. It may not be the beer you reach for every time, but its ability to satisfy a shadowy and visceral craving within you is what will keep you coming back, whenever you decide you’re ready. On that note, it must be time for a ride. And a brew.